Orthodontics (also referred to as dentofacial orthopedics) is a specialized form of dental treatment, focusing on the diagnosis, prevention, and treatment of dental and facial abnormalities most often the alignment and position of teeth and jaw bones. An orthodontist is a dental specialist who has received 2-3 years of additional training and experience after dental school. Your orthodontist is able to straighten teeth, correct misaligned jaw structure, and improve the functionality of your smile. 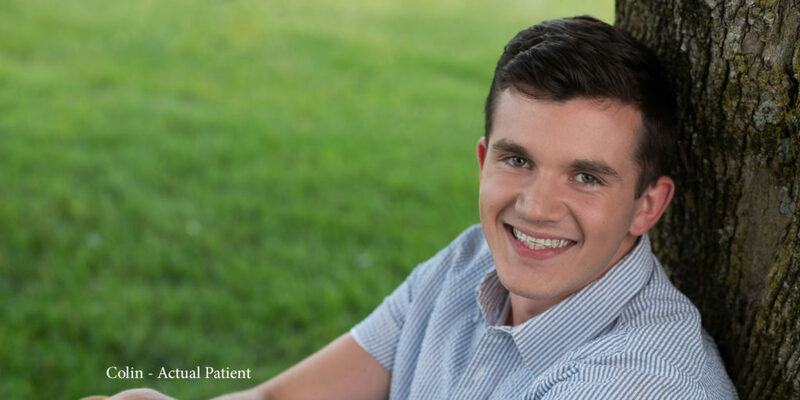 If you want to improve the look and feel of your smile, there’s no wrong age to start seeing an orthodontist. The American Association of Orthodontists recommends that children have their first appointment by the age of seven, however, orthodontic treatment is not exclusive to children and teens. In fact, approximately one in every five orthodontic patients is over the age of 21. Whether you’re considering treatment for yourself or for a child, any time is a good time to visit the orthodontist. Braces contain lots of nooks and crannies where food can get stuck and promote bacterial growth, so good hygiene is very important. You can keep your mouth healthy and clean by brushing with a soft toothbrush and fluoride toothpaste for 2-5 minutes after every meal or snack, and again before you go to sleep at night. Your final brushing of the day should be followed with an over-the-counter fluoride rinse – and don’t forget to floss daily! We recommend superfloss, which can be easily threaded through braces. Above all we recommend the ARCH Rule of 5’s as the tooth brushing technique. Click here to download our Brushing Rule of 5’s instructions. If your doctor asks you to wear elastics, you will need to wear them all the time, even during meals, and change them every 24 hours. If you have any trouble with your elastics fitting properly, call us immediately to schedule an appointment so you don’t lose progress. If you lose or run out of elastics, let us know right away so we can provide a new supply or mail you replacements. If you take out your retainer to eat, brush your teeth, and floss, remember to keep it safe in its container so it doesn’t get lost or broken. Keep your retainer clean by brushing it gently with a toothbrush and handsoap or dish detergent which are both better than toothpaste (which you may also use). You may also use denture cleaner twice a week if you desire. Do not use hot, boiling water or the dishwasher. During your treatment, try to avoid foods with a lot of sugar (sugar increases the amount of bacteria that grows in your mouth, causing more plaque and promoting the formation of cavities). Avoid sticky and chewy foods (caramel, chewing gum, gummy bears), hard foods (hard candy, nuts, ice cubes) or any foods that could possibly get stuck in your braces (corn on the cob, bagels, ribs, taffy, etc). See our complete lists of foods to avoid and foods you can eat. Be sure to schedule routine check-ups with your family dentist. We recommend dental cleanings with your dentist or hygienist every 3 months during active treatment. The amount of time spent in braces can vary depending on the individual patient. Every smile responds differently to treatment. Treatment times can take anywhere between 6 and 30 months. However, most standard treatments last about 22-26 months. We often recommend getting cleanings every 4 months while undergoing orthodontic treatment to ensure the healthiest of mouths and most successful treatment. Braces typically do not hurt, but you may feel a small amount of discomfort for a couple days as your teeth, gums, cheeks, and mouth get used to your new braces. With braces, we recommend you follow the Rule of 5’s and brush 4-5 times every day to keep your teeth, gums, and mouth healthy and clean. Brushing regularly will help remove any food that may be caught between the braces. You should also floss daily to get in between your braces where your brush isn’t able to reach. Your orthodontist and team will show you how to properly brush and floss once your braces are placed. Playing an instrument or a contact sport may require some adjustment when you first get your braces, but wearing braces will not stop you from participating in any of your school activities. If you play a contact sport, it is recommended that you wear a mouthguard to protect your mouth, braces or appliance. We are delighted to give you one to use with your appliances. 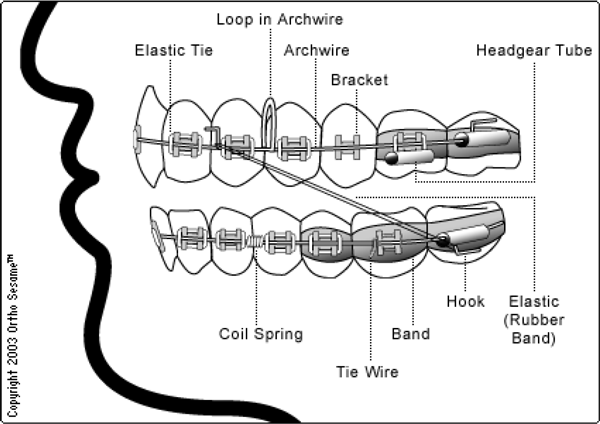 What are the names of the components that make up a set of braces? Tiny rubber band that fits around the bracket to hold the archwire in place. throughout treatment, as teeth move to their new positions. Small attachment that is cemented directly onto the tooth’s surface that holds the archwire in place in lieu of placing a band or ring around the tooth, and it allows us to control tooth movement. A thin ring of metal with a bracket attached which is fitted around molar teeth and bonded in place to control molar tooth movement and/or support appliances such as lip bumpers, lingual arches, or head gears. provide pressure to move the teeth.